One day early in our marriage, Steven and I were on one of our used bookstore dates, and I came across this book in the Spirituality section of the store. I read the description on the back and the first couple of pages, and the book had my attention. Written by an atheist hippie turned Protestant turned Eastern Orthodox, this book reflects on the Orthodox Church and contemporary culture. The narrative alternates between describing/reflecting on parts of Orthodox liturgy and all the “stuff” that goes on in real life. You start to realize that in some mysterious way all the kairos-time worship filters into to the chronos-time everyday life. How did this book change my life? I used to be evangelical Protestant. I grew up in the Nazarene church. Actually it should be Grew Up, with capitals. I was a Nazarene preacher’s kid and missionaries’ kid. I went to a Nazarene college. I was fourth generation Nazarene in my family. And then I became Orthodox. 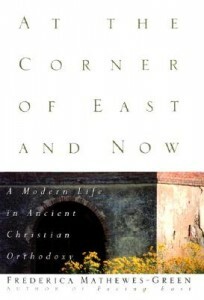 This was the book that introduced me to Orthodoxy. I read this book, then I read Praying With Icons, then I dragged my husband and mom to St. Ignatius (the church we go to now) one Sunday, then Steven bought me an icon of Christ. I was curious, intrigued, interested. But it wasn’t until 3 or 4 years later that we actually started attending the Orthodox church regularly. Now we’ve been there for 7 years. Anyway, this book is good, but honestly it’s not in my top ten best reads, it’s not some award-winning book or anything. It’s a quiet, thoughtful presence. But it changed my life. And here’s Karla’s book for today. I have never heard this story before! That is really cool that it literally changed your life! This was really hard for me. I posted the book “Showings” by Julian of Norwich because it has been an encouragement to my life from before Orthodox Christian worship. But really I do not have a book that has changed my life, but God has worked through several books and I hope He is still working through many things to change my life! The Bible is the first book that comes to my mind as a life changer. I grew up with a Bible story book that I still have and is dear to me as it is very well written and the pictures are beautiful and I learned that God is Love beyond all doubt partly through this book, but mostly through those Christian family members around me. Next I remember reading my first CS Lewis book at the age of 11, it was Prince Caspian and my mother gave it to me. A lady she worked with recommended it because my mother had told her I was having a difficult time what with her remarrying and moving twice within the past 6 months. Through Lewis’ story I glimpsed the Love that God is and I took great hope for my life and what might come from the adventure I was on through reading about the adventures in Prince Caspian. The book by Julian of Norwich came into my hands while we were overseas and I read it at about the age of 32. I had never read an account of someone who asked the things from her relationship with God that she asked, but all through her writings the God that is Love pours through. For years I carried around in my wallet a little card with the words,“God is nearer to us than our own soul, for God is the ground on whom our soul stands.” The quote was attributed to Julian of Norwich, but I never really considered it until I was reading the book and saw the quote there. Also, Julian of Norwich refers to God loving us so tenderly that He has much compassion for our physical well being and our weakness in illness, this has been brought to my mind and heart while praying for others. Thanks for the opportunity to consider these things!